A while back, Wendy posted her morning and evening skin regimens. At the time, I was still trying out some products to see what would make the cut for my own skin routines. Now that I’ve decided on my line-up, it’s my turn to share. 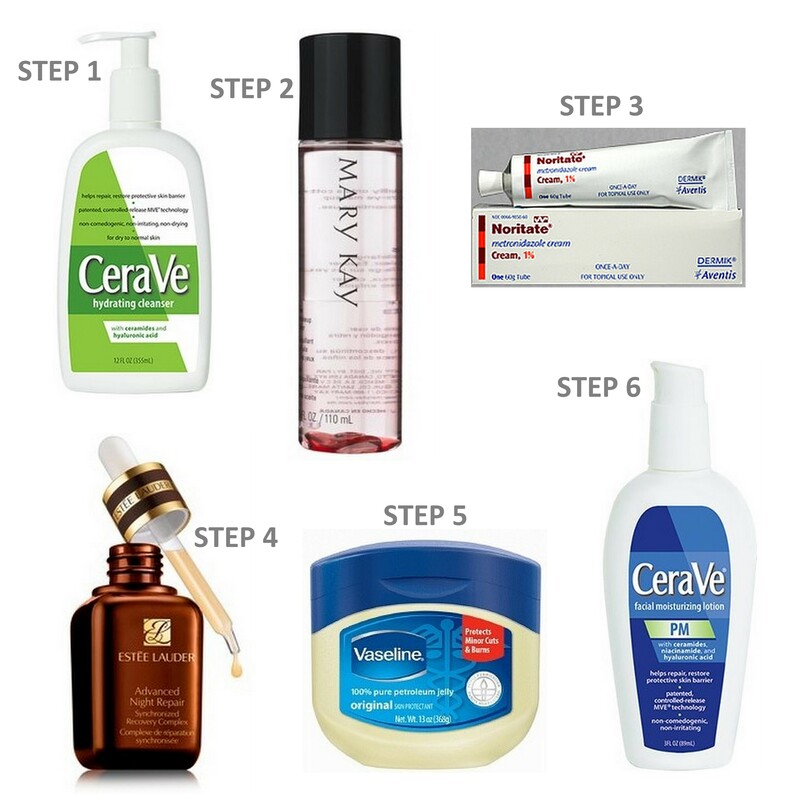 Step 1: Cleanse – Seeing that you’ve washed your face the night before (right?? ), then you shouldn’t have to scrub your face too hard. I use CeraVe Hydrating Cleanser both day and night. It’s creamy and gentle. Step 2: Repair – Both my day and night serums are made by Estee Lauder. If you remember, I also recommended these to Lynnette for her beauty makeover. My daytime serum is Idealist Pore Minimizing Skin Refinisher. It has a silicone base, which makes for a smooth finish and also acts as a nice primer for my foundation. Step 3: Protect – And of course, I never leave the house without sun protection on my face. As I recently wrote, I’m using COOLA Face SPF20 Mineral Sunscreen. It’s great under my makeup and safe for sensitive skin. Step 4: Protect … lips – I keep a tube of Chapstick Ultra SPF30 lip balm right by my door, so I can slap some on my kisser before leaving the house. Step 2: Remove – As I wrote not too long ago, this Mary Kay Oil-Free Eye Makeup Remover is my secret weapon for removing all remnants of eye make-up. Step 4: Repair – Within the last month or so, Estee Lauder has launched a campaign for Advanced Night Repair promoting new clinical study results. I like this serum, because its super hydrating but not tacky and has lots of good ingredients I can’t pronounce. Step 5: Moisturize – Since I invested serious cash in my two Estee Lauder serums (each around $75), I was on the hunt for an affordable moisturizer. What luck that CeraVe Facial Moisturizing Lotion PM is an excellent option with lots of ceramides and hyaluronic acid, all for less than $15. I love it. Step 6: Lock in lip moisture – I know, I know, it’s not the best product in the world to use on your face, but I’ve yet to find any other product that keeps my lips from drying out overnight. Good old Vaseline Petroleum Jelly really does the trick. As a reminder, these are products that work for my skin type (dry, sensitive skin with rosacea). You need to find products that work well for you. If you have the money to invest in your “repair” products, then have those brand representatives give you a sample first so you can make sure it doesn’t clash with your skin. I focused on my face products above, but I also tend to my hands morning and night, as well as throughout the day. 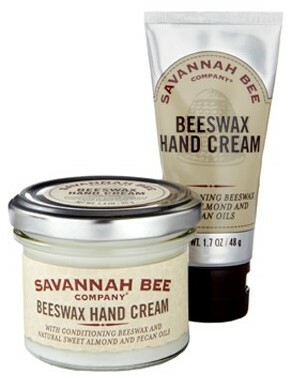 As I said in my Beauty Bill of Rights way back when, I apply sunblock to my hands nearly every day, and at night, I use Savannah Bee Beeswax Hand Cream from a jar I keep on my nightstand. I love this emollient non-greasy hand cream so much that I also keep a tube in my purse. Beautypendents, how do you care for your skin on a daily basis? Share your skin routines in the comments below! This entry was posted in Vanity and tagged CeraVe, Chapstick, Coola, daytime, dry, Estee Lauder, evening, Mary Kay, morning, nighttime, regimen, Rosacea, Savannah Bee, sensitive skin, skin care, Vaseline on January 31, 2012 by jenn. You can’t beat Cerave p.m. at any price for stick-with-you-all-night moisturizer. Not as in sticky, or heavy; you will simply still have soft skin in the morning. I also use Cerave a.m. I find it requires a lighter hand, but with just the right amount it’s good under make-up for a moisturizer with sunscreen. Dunno if you will ever read this. But this is my favorite morning regimen that I always go by everyday. 1. use CeraVe PM cream (two squirts) to cover your face before you put on sunscreen, this helps to avoid burning out or irritating or drying out your skin because sunscreen with higher SPF can do that to your skin. 2. I highly recommend Shiseido’s Ultimate Sun Protection Lotion WetForce SPF 50+. You don’t need too much. a penny or nickel size on your hand palm up. then tap it evenly around your face then spread it evenly. Thanks for chiming in. I’m still using that same CeraVe PM cream, too! I use the CeraVe cleanser & moisturizing lotion in the morning, in the evening I remove my makeup with a handmade goats milk soap, then I use my Aubrey Organics aloe vera gel, as my toner a few times a week. Also, I use a handmade scrub made with jojoba beads which doesn’t irritate my skin, this I do once a week to exfoliate my skin. Thanks for sharing your regimen, Leslee! Finding a good exfoliator is my next product to track down. When you say “handmade”, do you mean you make it yourself? If so, color me impressed! I just booked an appointment with a new dermatologist next week. I’m praying she’ll have a miracle for me (that’s not IPL)! I love this nightcream- Revlon Eterna ’27’ Moisture Skin Cream with Progenitin. It’s getting harder and harder to find, as it’s been around since the 1960s. Progenitin is actually an estrogen precursor, so it is supposed to keep the skin youthful. My grandmother used it since it came out, and I swear she didn’t have a wrinkle until her 70s. If you read the reviews on Walgreens.com, most women buying it have used it for 20-30 years, and also swear by it. Its definitely on the greasy side, so not recommended for oily skin types. Correct me if Im wrong but according to that I know the Chapstick product doesnt have enough UVA protection.